This past Friday we had our 2nd annual Fool’s Gold holiday jam. Even with a NYC blizzard in full effect all day, the true believers came out to party with the FG fam and our special guests DJ Premier and Cipha Sounds. 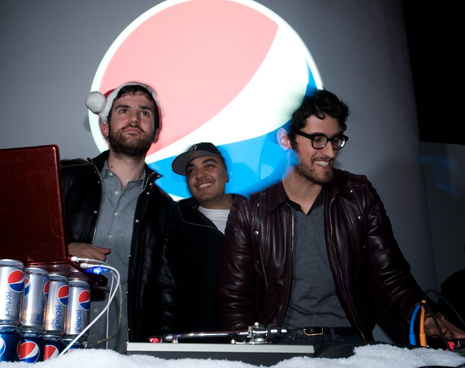 Kid Sister and Trackademicks cut it up on the dancefloor, Daniel LA Riots and Linus JOTS were spotted with Pepsi-n-Hennessy coctails in hand, Primo dropped “Hold It Now Hit It,” and a festive time was had by all. (Dust swears he saw Macaulay Culkin in the mix but I don’t believe him he needs more people). Check out Ian Meyer’s gallery of party pics here, and some Trackademicks snapshots here. As a bonus beat, watch some interview footage John Brown (“KingOfDaBurbz”!) was filming at the party on his Flipcam.